Hello everyone Today, we are going to discuss a little bit about the cleaning process we encounter when we take on a new resurrection project. 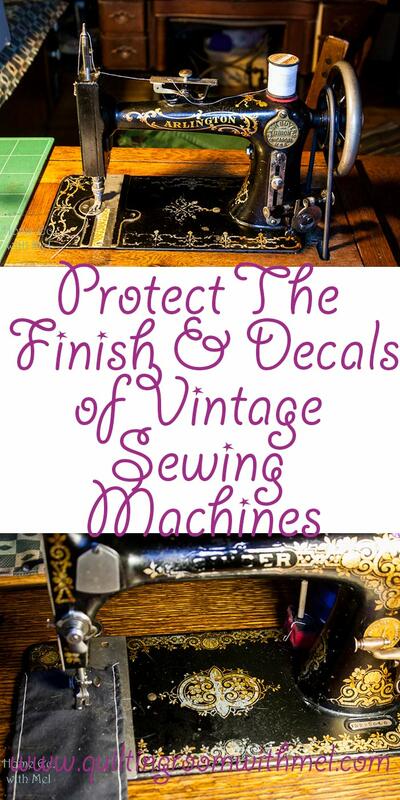 All old sewing machines that have been in storage will need a bit of TLC if we are planning to put them back into daily service. If all they need is a good dusting and all the joints oiled, we won’t be getting into too much detail concerning their cleanup and lube. We are going to get into details when we talk about the barn rescues, salvage machines and the out of sight, out of mind, time abused sweethearts we all encounter. We are going to talk about different ways to clean the outer surfaces to remove the years of oil and grunge. We are going to try to convey some ideas about rust removal and freeing of stuck and rusted parts. I use the term “resurrection “instead of the phrase “restoration” because in my personal opinion a restoration is a complete teardown and all new parts replace the worn ones. All the paint and chrome would look like new with no chips or pits, the decals would be new and basically, it would be a brand new old machine. There are some enthusiasts who do this kind of work and do it very well. I admire their talents and the machines when they are finished. I am just not the one to do that kind of work. I do clean and polish my machines. I do bring back all the original functions if possible and will replace broken parts with repaired ones when new ones are not readily available. I also find the character in chipped paint and worn off decals. All the pin rash scars left behind by years of love and affection on some of these old machines are stories waiting to be heard. I admire the beauty of a machine handled so much the nickel plate, or chrome is worn off and the steel under it is polished smooth and turned to brown. I only add more chapters to its life when I use it. Another scratch or more worn off decal doesn’t detract from the story, it adds to the history. When we start a resurrection project here in the quilt room we survey the entire machine and determine where we need to start first. For this example let’s just assume that we are dealing with a head only. No motors, lights or electrical work needed on this machine. Let’s also assume the mechanical parts are stiff and sluggish with old oil and grunge with rust keeping the presser foot from moving. Sounds pretty typical for a lot of machines being pulled out of long term storage, not exactly abused but accidently neglected. Now the machine category starts to diversify. The older basic black, straight stitch machines were usually decorated one of two ways. They were hand painted, sometimes inlaid with mother of pearl. Or they were adorned with water slide decals. The black painted surface was covered with shellac to seal the paint and add gloss to the machine. 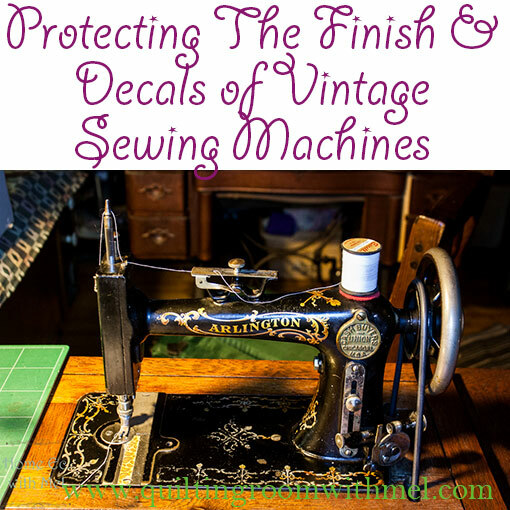 Some of the decals were placed on the machines before the shellac and some were done after depending on the manufacturer. If the decals were on before the shellac then the shellac will protect the decals from damage while cleaning the body. If not then they can be damaged by different cleaning solutions. The damage can range from removing the color from the decal (silvering) to actually removing the decal with a water-base cleaner. Most manufacturers from that era recommended using sewing machine oil (SMO) for cleaning the outside of the machine. It doesn’t remove water soluble decals and it is safe for the shellac finish. It isn’t a very quick way to clean but it is effective when used with a cotton ball and a plate full of persistence. Most petroleum based solvents and cleaners work to speed up the process of cleaning; it is advisable to always test a small section out of sight or on the underside of the machine before using anything other than the recommended products. And always bear in mind the flammability of the cleaner and the ventilation requirements, some cleaners are not meant to be used on the kitchen table or any other room in the house. Alcohol (the rubbing kind not the drinking kind) will eat a shellac finish in seconds. If you accidently spill some on the shellac do not wipe it off. Allow it to evaporate and the shellac to set back up solid and then carefully use SMO and a cotton ball to buff the surface clean. With a little luck, it will polish out and be unnoticeable. Since technology leads to progress, it is acceptable to believe that with the technological advantages of multi-stitch machines we should also expect some changes on the surface of sewing machines as well. Since we have more than just forward and reverse stitches we have also added color. Gone are the basic black machines. Also gone is the shellac finish. Varnish and the clear coat is now the latest greatest thing to shine up the finish of the newest sewing machines. Decals are also a thing of the past as well. The varnish and clear coat over the paint are much more forgiving when it comes to cleaning. It is of course always advisable to test any cleaning agent on an inconspicuous spot before soaking the entire machine only to find out it removes everything down to the bare metal. Most clear coated machines are easily cleaned with any household water-based spray cleaner or automotive product safe for paint and polished to a glow with furniture polish or car wax. Plastic body parts, side pieces, and knobs really don’t need much explanation. Plastic is plastic and should be handled as such. It matters not what it is or does, it is still plastic and can be washed as easily as the dishes in the kitchen. I started this as a blog post and not a novel so I think for today we will stop with the cleaning of the exterior finishes of the machine. Next time we start with the real work of removing the true grunge, old oil, and gunk. I promise to let you into a place you will get your hands dirty. Until next time if you treadle (sew) with your shoes off keep track of your pins and needles. Timely for me--I'm getting a salvage machine from my cousin very soon. This will be the first machine I've ever worked on! I'm not so concerned with the electrical part--I know that is in bad shape. My aim is to make a treadler of it. It has a wheel for the belt. I want to clean it and get it working, and your posts will be a great help--thanks! I have a "the Free" treadle and in moving some of the peaces were lost. would you know were I my be able get replacement parts. I hope you come back to find this since I don't have contact info for you. I get most of my parts from Cindy Peters. You can email her at stitchesintime at earthlink dot net.